Overview: SIMION Version 8.1 is a software package primarily used to calculate electric fields and the trajectories of charged particles in those fields when given a configuration of electrodes with voltages and particle initial conditions, including optional RF (quasistatic), magnetic field, and collisional effects. 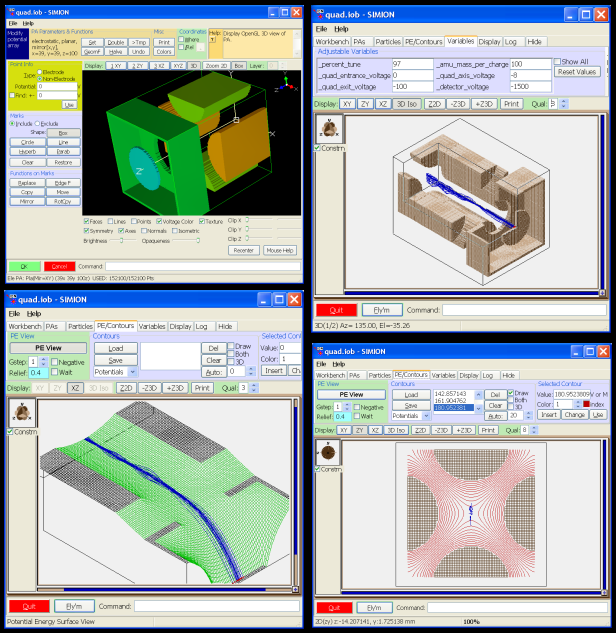 In this, SIMION provides extensive supporting functionality in geometry definition, user programming, data recording, and visualization. It is an affordable but versatile platform, widely used for over 30 years to simulate lens, mass spec, and other types of particle optics systems. Emphasizes speed, accuracy, refining, and programming APIs. Applications: SIMION is suitable for a wide variety of systems involving 2D or 3D, static low-frequency (MHz) RF fields: from ion flight through simple electrostatic and magnetic lenses to particle guns to highly complex instruments, including time-of-flight, ion traps, RF quadrupoles, ICR cells, and other MS, ion source and detector optics. Audience: No program can be all things to all people. SIMION is aimed at a wide audience, with extensive use in both academia and industry, including by most of the major mass spec manufacturers. SIMION is positioned as an affordable package that nevertheless provides solid implementations of many core capabilities (listed below), even a choice among multiple approaches (as when defining geometries). The program uses direct methods such as finite-difference that are straightforward to apply but are also optimized and extended, making SIMION suitable for a wide variety of real-world systems. The methods are interactive to promote understanding, allowing you to adjust parameters during the simulation and immediately visualize the resultant fields and trajectories. The software is programmable, allowing users to extend and automate the capabilities in novel ways. It is also substantially documented. It runs on Windows and Linux. What SIMION is not: SIMION's scope does not, at least currently in itself cover high-frequency (HF) radiation problems and certain more advanced types of magnetic problems, though these are expanding. For example, space-charge limited cathode emission, secondary emissions on curved surfaces, and certain fine geometries in BEM are really the realm of CPO. Some FEM packages go more into other physical areas beyond the scope of the particle optics focus of SIMION 8.1. There is, however, the possibility to use SIMION with these other programs. Figure: Screenshots above show model, field, and trajectory views of an RF quadrupole example in SIMION 8. See also more screenshots. History: SIMION software has a long history with an initial version developed in the late 70's by Don McGilvery at Latrobe University, Melbourne, Australia, the first PC versions starting in the early 1980's and developed for the next two decades up to Version 7 under David Dahl at Idaho National Laboratory (US Department of Energy), and version 8.0 and then version 8.1 continued at SIS. Electrostatic field solving in 2D and 3D, up to almost 20 billion points (190GB) (expanded in 8.1, under 64-bit systems with sufficient RAM), optimizations for symmetry and mirroring. Uses finite difference with much optimized linear-time solving. Small arrays solve in under a minute; large arrays may take roughly an hour (varies on conditions). A workbench strategy allows you to position, size, and orient up to 200 instances (3D images) of potential arrays of different grid densities and symmetries to permit the simulation of much larger systems that don't easily fit into a single array. Magnetic field support: SIMION traditionally has provided only basic magnetic field support, but this is expanding. SIMION supports magnetic scalar potential (since around 6.0), which is identical to the electrostatic case and Biot-Savart wire/solenoid calculations (enhanced in 8.0.3). Also, an arbitrary (vector) magnetic field can be imported from an external program or defined analytically. Magnetic fields can optionally superimposed on an electrostatic field (e.g. penning trap or ICR cell), for the purpose of particle flying. SIMION 8.1 provides programmable vector plotting, used in a few B-field examples, for better visualization. The early access version recently supported magnetic permeability and the basics of magnetic vector potential, and these capabilities are expanding. See Magnets. Dielectrics were added in 8.1.1. 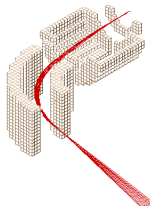 Particle tracing: Particle trajectories are calculated given previously calculated or defined fields. Includes relativistic corrections, Runge-Kutta with variable-length dynamically adjusting and controllable time-steps, and user programming capabilities for novel effects (such as ion-gas scattering). Particle mass and charges can be defined individually or according to some pattern or distribution (enhanced FLY2 format is new in version 8). Particle tracing is fast--millions of particles can be handled. Geometry definition via multiple methods: a 3D paint-like program (Modify), CAD import from STL format (new in version 8 or SL; improved in 8.1.1.1), solid geometry defined mathematically via a text file (GEM file), and programmatic manipulation of arrays from such languages as Perl, Python, C++ (SL Libraries) (new in version 8 or SL), and Lua (8.1). Contour and potential energy surface plots (optionally with ion trajectories superimposed) are displayed interatively and are a core feature of viewing. Viewing of the system is highly interactive, allowing adjustment of parameters and viewing of the system even during ion flight. Supports cutting away volumes to see trajectories inside; zooming; viewing potential energy surfaces, contour lines, and trajectories; and reflying particles as dots for movie effects. Nice OpenGL viewing (new in version 8) of potential arrays also available. Data recording of parameters at various stages in particle flight, to screen or delimited text file, for subsequent analysis of fields and trajectories. Analysis can be done via SIMION 8 user programming, in a program or language of your choice (e.g. Excel), or other programs. User programming: During ion flight, you may control electrode voltages, define or modify fields, scatter or deflect ions (e.g. ion-gas collision models), tune (optimize) lens voltages, compute results, export data to programs like Excel via a COM interface, and do many other things. The Lua language (new in version 8) is now directly embedded in SIMION. Programming may also be used to operate SIMION in batch mode (new in version 8), such as for geometry optimization, or read/manipulate potential array files (new in SL or 8). Documentation and examples: SIMION comes with an extensive 450-page printed manual, additional electronic documentation, example files, and ASMS course notes. The supplemental electronic documentation much expanded in 8.1 (a subset is online). You can find hundreds of academic papers that utilize SIMION. Package contains a 450-page printed manual, installation CD with software license key number (for receiving software updates), and quick start notes. The installation CD installs the software, examples, and additional documentation. Upgrades: Free upgrades to 8.1.x.y versions for users purchasing SIMION 8.1. Free upgrades to 8.0.x.y versions for users who have purchased SIMION 8.0. Upgrades are electronic downloads from the "Check for Updates" button on the SIMION main screen. Support: Limited free support via email and phone is included, and there is a message board. See also documentation above. Supported systems: Latest versions tested on Windows 7, Vista, XP, 2008, 2003, as well as Wine/Linux and CrossOver Mac. See also System Requirements. Users of previous versions of SIMION, please see Changes in SIMION 8.1. CPO - If SIMION is not enough for you, we also provide this alternative high-end package, which provides high accuracy and space-charge, space-charge limited cathode emission, and dielectrics calculations via its distinctive advanced boundary element method (BEM) of calculation--in which the electrode surfaces are defined by a non-rectangular surface mesh and the charges on the surface, and optionally in space, are calculated as an intermediate step. Additional built-in features, and approx. 100 examples included. Virtual Device - developed independently by a SIMION user, this program provides a GUI for building GEM files, plotting/data analysis for recorded SIMION data, and ION file creation. For more information, see the examples and online documentation. - Have SIMION questions? need answers? Join the web- and e-mail-based SIMION Ion Optics Users Group to other SIMION users, or contact SIS. [2010-06-20] Virtual Device v. 21 hydrodynamic version soon to be available. Now supporting gas flow calculation and collision model suitable for ESI virtual jet simulation, as well as improved 3D geometry editor and data analysis. [2009-09-21] International Conference on Ion Sources being held in Gatlinburg, Tennessee. [2006-11-22] SIMION 8.0.0 (first SIMION 8.0 release) is now shipping. [2006-11-22] CPO now has dielectrics support. [2005-04-29] Advanced CPO software now available supporting space-charge, cathodes, and high accuracy via the Boundary Element Method (BEM). [2004-08-03] Virtual Device software by Koltsov Sergei--Easily assemble SIMION geometry files and analyze SIMION data. [2004-04-27] sltools.exe - CAD import and PA utility. [2004-03-24] Article: "Exporting Electrostatic and Magnetic Field Data from SIMION (and Importing it too)"
[2003-12-22] The SL compiler and toolkit for SIMION is now available for purchase. (Aug 2012/Aug 2013): CPOTS2012 and CPOTS2013 courses on Charged Particle Optics Theory and Simulation, Dr. Zouros, University Crete, ERASMUS intesive program for universities in Europe. (Sep 2011) Charged Particle Optics: Theory & Simulation two week intensive course with SIMION 8.1 labs, Theo Zouros, Erasmus Programme, Crete is now complete. (May 2010): The book Advances in Imaging and Electron Physics, Volume 157: Optics of Charged Particle Analyzers (Aug 2009, 408 pages) by SIMION user Mikhail Yavor (RAS) includes throughout the text figures acquired from SIMION simulations. Intended for a wide audience, the book overviews the optics of charged particle analyzers, including aberrations, transport in static and RF electric and magnetic fields, energy and mass analyzers, TOF, and RF traps/mass filters. Available via Google Books | Amazon.com | Barnes&Noble | Elsevier. (May 2010: Article: Modeling extreme ultraviolet suppression of electrostatic analyzers [online] by Daniel Gershman and Thomas Zurbuchen in Rev. Sci. Instrum. 81, 045111 (2010) -- Novel use of SIMION to simulate surface scattering of extreeme ultraviolet (EUV) photon particles (charge=0), which reduce signal-to-noise in TOF instruments used in outer-space environments.